It’s a Nikon coupon promotion 4-day extravaganza at KEH Camera. 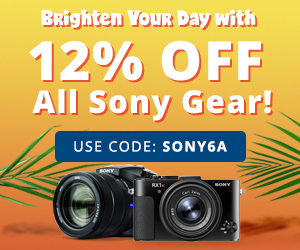 Using coupon code NIK3A you can get 10% off select Nikon camera gear up until 3/17/19 at 11:59pm eastern time. Hooray, once again a lens is headlining the Monday daily deals at B&H Photo, it is the Zeiss Distagon T* 25mm f/2 ZE (Canon EF mount) going for $749 with free US shipping. Unfortunately for Nikon fans, the Nikon mount option is discontinued at B&H and obviously cannot be ordered or pre-ordered. The Pentax lens price-check is a gift that keeps on giving. This surfaced in the Adorama Used store, a well-used Pentax 16-50mm f2.8 ED-AL IF SDM is going for $249 plus shipping. Supplies are very limited, so if you don’t see anything at the aforelinked page, it means the used inventory sold out. The Adorama Featured Holiday Deal of the day for Monday DEC-10-2018 is the new condition Sigma 18-250mm f/3.5-6.3 DC Macro OS in the Canon EOS system only, going for $269 with free shipping. Only this mount and this kit is on sale. The other options (eg with freebies) are not on sale. This is a limited time offer. Good until Sunday 11:59pm ET, Woot is offering this refurbished Canon D-Rebel XS bundle for $220 with free shipping for Prime members, or flat shipping for everybody else. The bundle includes the DSLR with the 18-55 IS EF-S II lens, two converter lenses, 32GB SD card, camera bag, and lots of trinkety accessories. Also part of the Woot daily deals is a refurbished Fire and Kindle sale which includes Fire tablets going from $25 to $60 [how tablet prices have fallen! ], and a handful of e-book readers as well going from $23 [with or without Touchscreen) to $160 [6-inch Oasis with free 3G). Or the Voyage for $100 if you prefer tactile page-turns [in addition to the touchscreen]. The PM edition of our Black Friday continues with a Pentaxian full frame temptation. For a limited time, the Pentax K-1 II bundled with the 28-105mm f3.5-5.6 ED FA L lens sells for the same price as the body only, $1897 with free shipping at Adorama which includes the Pentax D-BG6 battery grip (nice!) and the Pentax DSLR sling bag and a padded strap too. For a limited time, the Pentax K-70 with the 18-135mm f3.5-5.6 ED AL IF DC WR bundle is discounted to $797 with free shipping with a different set of freebies at B&H Photo (Pentax DSLR sling bag, camera strap, F/Stoppers class) and at Adorama (Corel software, slinger bag, 16GB Lexar, etc) and various at Amazon. If you don’t need the “with 18-135 kit”, the body only goes for $595 with its own freebies of course. + Pixma PRO 100 printer, and its trusty sidekick, the 50pk of 13×19″ photo paper. 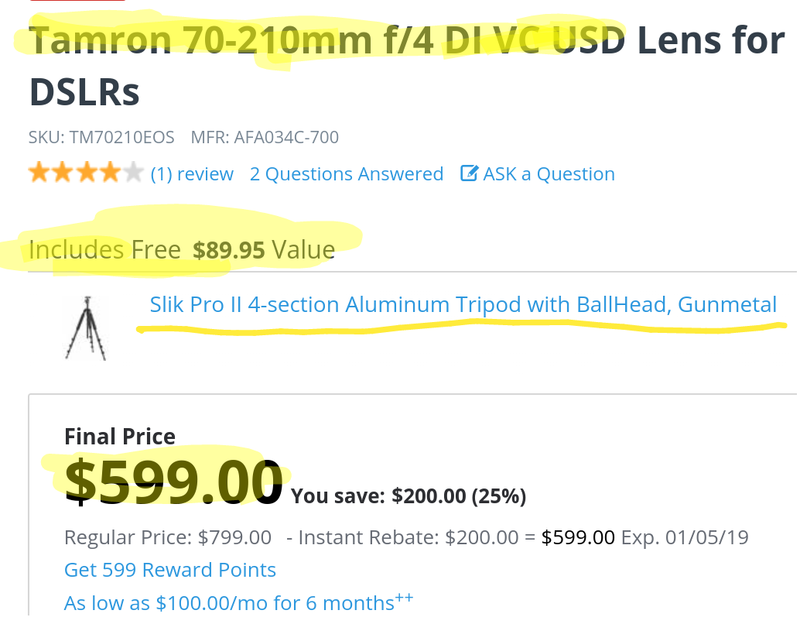 Things are also hopping at the eBay Deals where the BuyDIG eBay store is offering the manufacturer refurbished Nikon D7500 two lens kit (18-55, 70-300, both DX VR lenses) for $900 with free shipping and a 90-day Nikon USA warranty. Limit up to five per customer at the sale price. This can serve as a “take pictures with” entry-point into the Nikon APS-C DSLR system for more advanced photographers. As to the lenses, one or both can be sold/traded/gifted if they are not wanted/needed. On the more compact DSLR front, the new condition Canon SL2 with the 18-55 lens is currently on sale for a limited time for $550 with free shipping by Amazon itself with up to five kits per customer at the same price. This currently goes for $600. However, if you don’t need the 18-55 lens, the SL2 body only goes for $500 with freebies at places like B&H Photo and Adorama…. All these come with 4% B&H promotional rewards, which you can use in future B&H purchase. They also come with a free Zeiss lens care kit included by B&H. Canon and Nikon shooters have a lot of variety in 3rd-party lenses to choose from, one of the reasons they are popular systems. Which brings us to another Sigma lens offer that is only available for the Canon and Nikon DSLR systems. It is the new condition Sigma 70-200mm f/2.8 EX DG APO OS HSM bundled with the Sigma APO 1.4X teleconverter [included automatically by B&H during this offer], along with 4% promotional rewards [about $46 to be used in future B&H purchases]. All these for the one price of $1149. Nikon fans too, look under your chairs, you get a 2-lens deal too! B&H Photo is offering until NOV-11 at 11:59pm ET this Nikon D5600 two lens kit with the 18-55 DX VR and 70-300mm DX non-VR lenses along with a 32GB Sandisk Extreme card and a camera bag, AND 2% promotional rewards ($14~ to be used in future B&H purhcases) all together now for $697 with free US shipping. Both items are included automatically by B&H during this promotion.